You're walking through your home and reach for a doorknob when all of a sudden, you get zapped by a mild electrical shock as your fingers touch the metal knob. Reducing static electricity and preventing shocks takes just a few simple steps. Fly away hair and electrical zaps from doorknobs happens because of static electricity. Static electricity occurs when an electrostatic charge builds up and then discharges when you touch a conductor. If you've ever rubbed a latex balloon over your hair, and then stuck it to a wall or a person, you've seen electrostatic charge in action. Scuff your feet along the carpet when you walk, and then touch a doorknob or another person and you'll feel the zap. 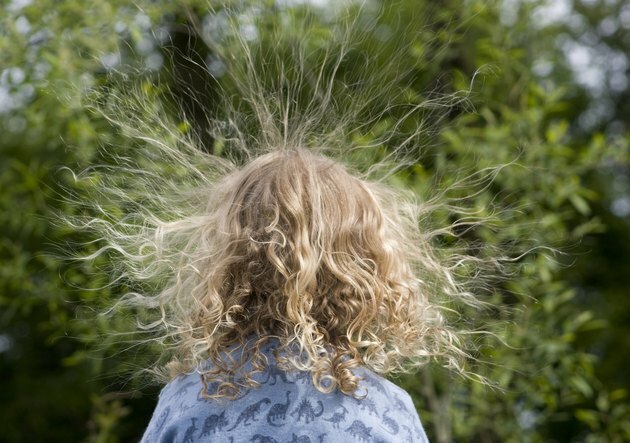 Static electricity is one reason that your hair frizzes up and your clothes stick and cling. Static electricity is more common in drier climates and during the winter when the air is drier. While receiving this mild shock is annoying, its generally not dangerous. But electrical equipment can be damaged by static electricity -- and if you happen to set off a zap while handling solvents or other flammables -- it can be a fire risk. Dry air, synthetic materials and carpeting are the common culprits when it comes to causing static electricity. Getting rid of static is not a step-by-step process, but there are tricks and tools to use to help reduce the static build up in your home and clothing. A humidifier, some dryer sheets and antistatic sprays are the primary tools for preventing static in most cases. To reduce the static charge from carpeting, add moisture to the room. Turn on a humidifier, or just simmer a pot of water on the stove. Keeping indoor plants will also help maintain higher humidity levels and reduce the chance of static build up. If static is a serious problem, try using an anti-static spray on carpeting to reduce the chance of building up a charge as you walk across the carpet. Static makes clothing cling to your body and makes it hard to fold. Can can reduce or eliminate static in the laundry by using dryer sheets. Any fabric softener also helps, but dryer sheets do better at eliminating the static. Pull clothes from the dryer while they're still slightly damp, then hang them on a clothesline to finish drying, and they won't have the chance to build up static. Tossing a damp washcloth into the dryer during the last 10 minutes of the drying cycle also helps to reduce static cling. If your clothes are already full of static, try lightly misting them with distilled water and giving them a good shake. Another option is to run the long side of a wire hanger over the clothes to discharge the static. You can also purchase anti-static sprays meant for clothing, but be sure to test the spray on an inconspicuous area of the garment first to ensure it won't damage the fabric. Some amount of static build up is inevitable, but you can take steps to reduce the static charge. If static electricity is more than a minor inconvenience, you can get static control mats, or even wear a specially designed wristband that discharges static electricity.